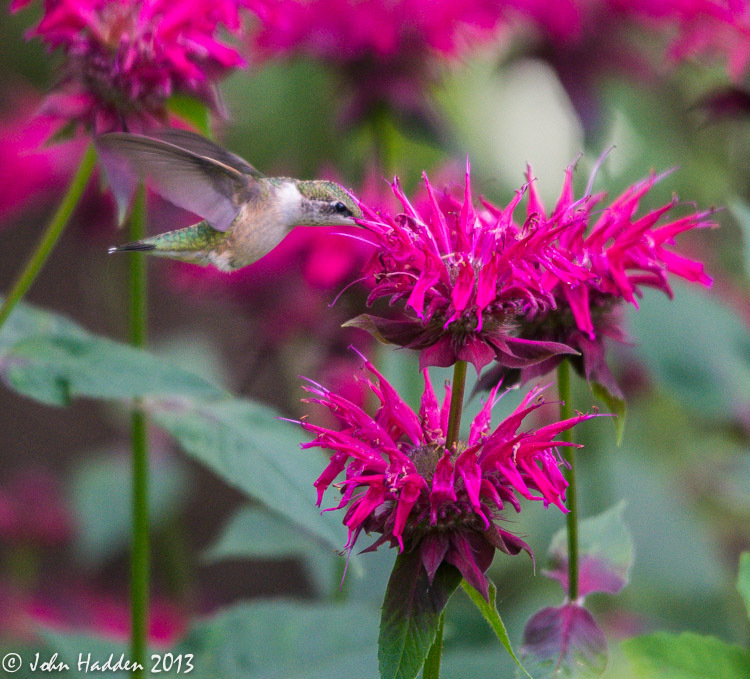 A juvenile ruby-throated hummingbird sips from the bee-balm out by our pond. For more photos, visit my Photo blog. This morning in Huntington at 7:00AM it’s currently 53 degrees under clear skies. Winds are calm. Relative humidity is 99%, dewpoint 53, barometric pressure 30.12″ and rising. Yesterday’s high was 74, and the overnight low was 52. High pressure is currently building into the region and will deliver a lovely sunny day with highs in the upper 70s and light and variable winds. Tonight should be mostly clear with lows in the upper 50s and light and variable winds. Thursday will start out partly sunny in the morning, then becoming mostly cloudy with a chance of thunderstorms and occasional showers in the afternoon as low pressure and an associated cold front approach from the west. Highs will be in the mid 70s with south winds 10 to 15 mph. Chance of rain is 80%. Thursday night will be showery with lows in the lower 60s and south winds 10 to 15 mph. Chance of rain is 80%. Friday’s looking mostly cloudy with a 40% chance of showers. Highs will be in the mid 70s with light and variable winds. Friday night should be partly cloudy with a 30% chance of showers and lows in the mid 50s. Last year on this date we had a high of 86 and a low of 60. Burlington norms for this date are highs of 81°F and lows of 60°F. Record high was 96°F in 1999 (we had a high of 92). Record low was 42°F in 1964. Assuming we have no rain today (a good bet!) rainfall for July was again quite high coming in at 9.30″. Tomorrow will be 2m 20s shorter. The Moon is a waning crescent, 23d 4h old with 33% illumination. I was out by the pond yesterday shooting bees in the bee balm with my macro lens when I heard the unmistakable burble of hummingbirds. Sure enough, three of the zippy little creatures were buzzing about the flowers, chasing each other about and resting in the trees periodically as well. I ran back into the house to get my telephoto lens. I snapped many shots of the birds and discovered that two of the three were juveniles as given away by their muted colors and the slight brown dappling at this one’s throat. Our only native hummingbird, the ruby-throated is an amazing little bird that flies clear down to South America for the winter. I wish them well on their journey! Nikon D600, Sigma 120-400mm lens @ 400mm, ISO 1600, f/5.6, 1/500″ exposure. For more photos, visit my Photography website! A silver birch grows atop a rotting hemlock stump. This morning in Huntington at 7:10AM it’s currently 56 degrees under mostly clear skies. Winds are calm. Relative humidity is 99%, dewpoint 55, barometric pressure 30.08″ and rising. We picked up 0.02″ of rain in the past 24hrs. Yesterday’s high was 78, and the overnight low was 55. High pressure is currently building into the region on the heals of a departing low currently over southern Québec. We’ll see partly sunny skies with highs in the mid 70s and west winds around 10 mph, becoming northwesterly this afternoon. There is the slight chance of terrain induced showers over norther higher elevations later this afternoon. Tonight should be clear with lows in the mid 50s and west winds around 10 mph until midnight, becoming light and variable. Wednesday should be mostly sunny with highs in the upper 70s and light and variable winds, becoming westerly around 10 mph in the afternoon. Wednesday night should be mostly clear with lows in the upper 50s and light and variable winds. Low pressure and an associated cold front will move into the region Thursday bringing showers and thunderstorms. Highs will be in the upper 70s with south winds 10 to 15 mph gusting up to 25 mph. Chance of rain is 70%. Thursday night should bring occasional showers and thunderstorms. Lows will be in the lower 60s. Chance of rain is 80%. Last year on this date we had a high of 85 and a low of 60. Record high was 96°F in 1959. Record low was 45°F in 1952. Tomorrow will be 2m 17s shorter. The Moon is a waning crescent, 22d 4h old with 43% illumination. Sometimes nature is a wonderful sculptor. This birch tree was growing atop a rotting hemlock stump by the Huntington River down at the Green Mountain Audubon Center. 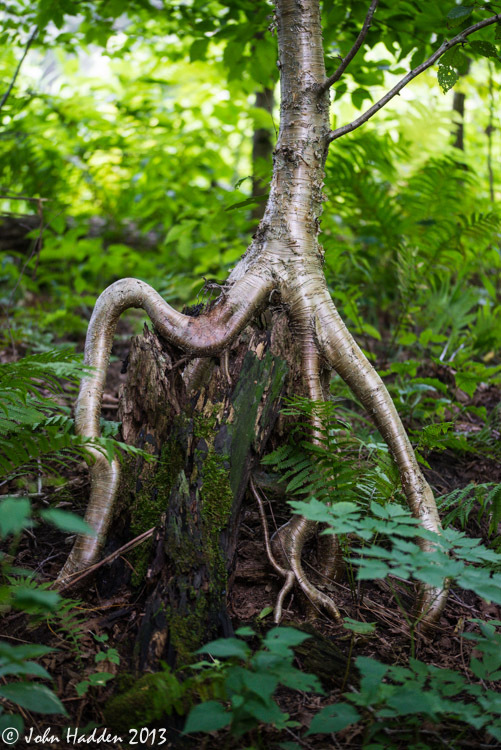 Almost octopus-like it reaches for the ground. Nikon D600, Sigma 105mm lens, ISO 1250, f/3, 1/400″. A skipper sips from a red clover blossom. This morning in Huntington at 6:45AM it’s currently 62 degrees under mostly clear skies. Winds are calm. Relative humidity is 99%, dewpoint 62, barometric pressure 29.96″ and rising. We picked up a whopping 1.77″ or rain overnight. Yesterday’s high was 77, and the overnight low was 62.
impact the region today. We’ll see partly sunny skies this morning as a dry slot moves over us. There’s a 40% chance of showers this afternoon as diurnal heating works on surface instability. Highs will be in the upper 70s with light and variable winds, becoming westerly around 10 mph this afternoon. Tonight should be partly cloudy with a chance of showers mainly until midnight. Lows will be in the lower 50s with light and variable winds. Chance of rain is 30%. Tuesday should be partly sunny with a 20% chance of afternoon terrain induced showers. Highs will be in the mid 70s with light and variable winds, becoming northwesterly around 10 mph in the afternoon. High pressure will build in Tuesday night bringing mostly clear skies with lows in the mid 50s and light and variable winds. Wednesday’s looking mostly sunny with highs in the upper 70s and light and variable winds. Wednesday night should be mostly clear with lows in the upper 50s. Last year on this date we had a high of 83 and a low of 57. Record high was 98°F in 1949. Record high was 45°F in 1987. The Moon is in its last quarter, 21d 3h old with 53% illumination. 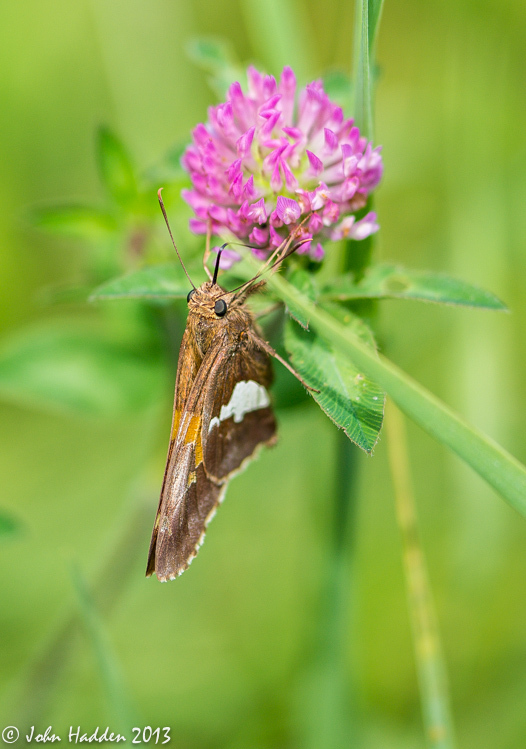 This skipper butterfly was flitting about in one of the fields of the Green Mountain Audubon Center in Huntington. I chased it through the grass a bit before it settled down long enough to get a shot. I like the delicate tongue lapping at the flower. Nikon D600, Sigma 105mm lens, ISO 200, f/3.5, 1/2000″ exposure. 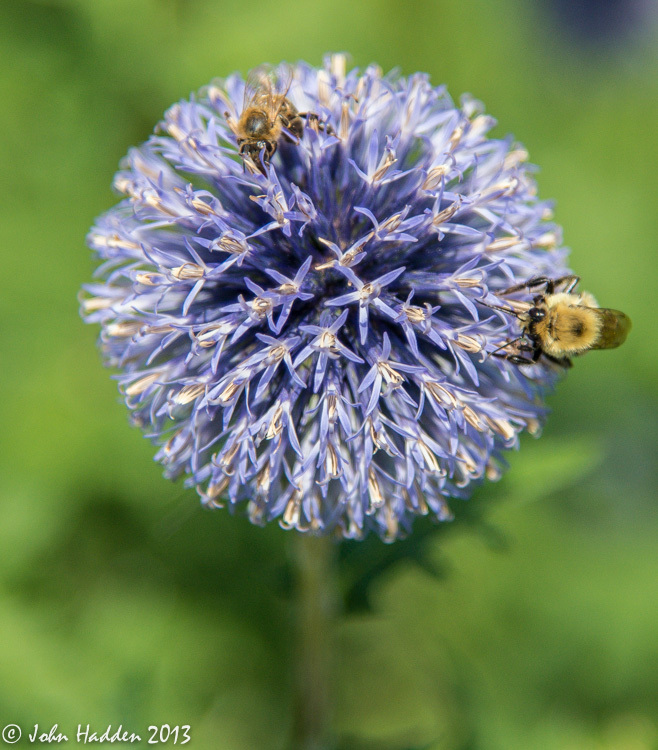 A thistle bloom attracts bees at Shelburne Museum yesterday. This morning in Huntington at 8:00AM it’s currently 64 degrees under overcast skies. Winds are calm. Relative humidity is 99%, dewpoint 64, barometric pressure 29.94″ and rising. Yesterday’s high was 80, and the overnight low was 57. Slow moving low pressure tracking eastward across the Great Lakes region will bring periods of showers to northern New York today most of Vermont tonight. We’ll see cloudy skies with scattered showers with a chance of thunderstorms. Highs will be in the upper 70s with light and variable winds, becoming southerly around 10 mph this afternoon. Chance of rain is 40%. Tonight showers are likely with a chance of thunderstorms until midnight. Locally heavy rainfall is possible. Lows will be around 60 with light and variable winds, becoming southerly around 10 mph after midnight. Chance of rain is 70%. Monday should be mostly cloudy with showers likely in the morning, then become partly sunny with a chance of showers in the afternoon as diurnal heating works on surface instability. Highs will be in the mid 70s with light and variable winds, becoming westerly around 10 mph in the afternoon. Chance of rain is 60%. Monday night should be mostly cloudy with a 30% chance of showers. Lows will be in the lower 50s with light and variable winds. Tuesday’s looking partly sunny with highs in the lower 70s with west winds around 10 mph. Tuesday night should be mostly clear with lows in the lower 50s. Last year on this date we had a high of 80 and a low of 57. Record high was 96°F in 1964. Record low was 45°F in 2001. Tomorrow will be 2m 13s shorter. The Moon is waning gibbous, 20d 4h old with 62% illumination. A snail edges along a leaf in the front field. This morning in Huntington at 7:45AM it’s currently 56 degrees under clear skies. Winds are calm. Relative humidity is 99%, dewpoint 56, barometric pressure 30.03″. Yesterday’s high was 71, and the overnight low was 48. Weak high pressure over the region will deliver us a sunny day. It’ll be warmer with highs in the lower 80s and light and variable winds, becoming southerly around 10 mph this afternoon. Tonight should be mostly clear until midnight, then become partly cloudy with a slight chance of showers after midnight as low pressure and an associated cold front move into the region from the northwest. Lows will be in the upper 50s with light and variable winds, becoming southerly around 10 mph after midnight. Chance of rain is 20%. Sunday should be cloudy with a chance of showers and a slight chance of thunderstorms in the morning, then showers likely with a chance of thunderstorms in the afternoon. Highs will be in the upper 70s with south winds around 10 mph. Chance of rain is 70%. Sunday night showers are likely with a chance of thunderstorms. Lows will be in the lower 60s with light and variable winds. Chance of rain is 70%. Monday’s looking mostly cloudy with a chance of showers. Highs will be in the upper 70s with light and variable winds. Chance of rain is 40%. Monday night should be partly cloudy with a 30% chance of showers and lows in the mid 50s. Record low was 46°F in 2001 (we had a low 42). Tomorrow will be 2m 11s shorter. The Moon is waning gibbous, 19d 4h old with 72% illumination. The bane of gardeners, snails have been prolific this season. 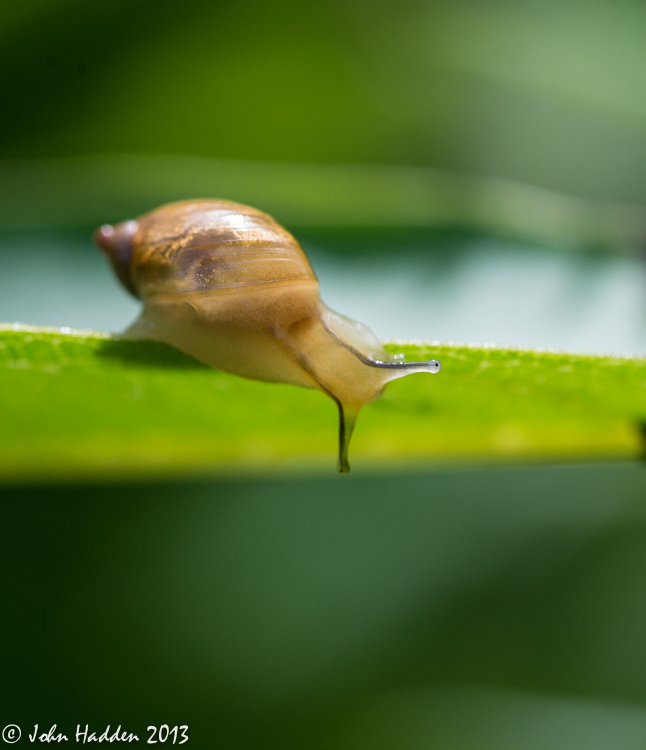 This little mollusk was creeping along the side of a leaf up in our front field. Once again, macro photography elicits many details that might otherwise go unnoticed. I especially like the eye stems and the translucency of the shell. Nikon D600, Sigma 105mm lens, ISO 250, f/8, 1/320″ exposure. 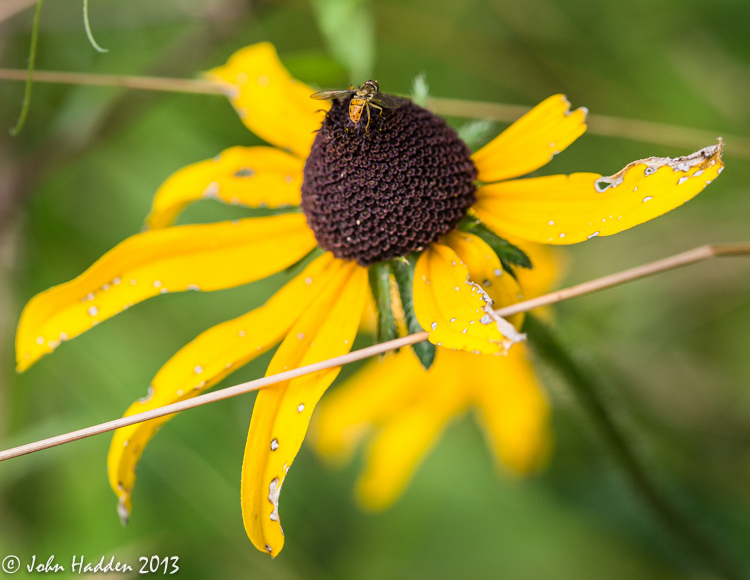 A soldier fly perches on a weathered black-eyed Susan. This morning in Huntington at 7:10AM it’s currently 51 degrees under overcast skies. Winds are calm. Relative humidity is 99%, dewpoint 51, barometric pressure 30.09″. Yesterday’s high was 71 and the overnight low was 49. Morning radar imagery shows a large slug of rain moving up the New England coast. A coastal low will pass near Cape Cod this morning and then head into the Gulf of Maine by this evening. This system will bring clouds to Vermont along with a chance of showers to eastern portions of the state, but we should ramain dry west of the Green Mountains. We’ll see partly sunny skies with a slight chance of showers this afternoon. Highs will be in the upper 70s with north winds around 10 mph. Chance of rain is 20%. Tonight should be partly cloudy until midnight, then clearing with patchy fog after midnight. Lows will be in the lower 50s with north winds around 10 mph until midnight, becoming light and variable. Saturday should be mostly sunny with highs in the lower 80s and light and variable winds, becoming southerly around 10 mph in the afternoon. Saturday night should be partly cloudy with a 30% chance of showers as a low pressure system and associated cold front approach from the west. Lows will be in the lower 60s with south winds around 10 mph. Sunday should bring occasional showers. Highs will be in the upper 70s with south winds around 10 mph. Chance of rain is 80%. Sunday night should bring occasional showers with a chance of thunderstorms. Lows will be in the lower 60s. Chance of rain is 80%. Last year on this date we had a high of 68 and a low of 58. We picked up 0.01″ of rain. Burlington norms for this date are highs of 81°F and lows of 61°F. Record high was 94°F in 1939. Record low was 45°F in 1976. Tomorrow will be 2m 10s shorter. The Moon is waning gibbous, 18d 4h old with 82% illumination. Black-eyed Susan’s are nearing the end of their bloom time. We have many along the roads and in our front field. The flies and bees still love them though! Nikon D600, Sigma 105mm lens, ISO 250, f/8, 1/200″ exposure. Queen Anne’s Lace is a busy place! This morning in Huntington at 6:30AM it’s currently a cool 41 degrees under clear skies. Winds are calm. Relative humidity is 98%, dewpoint 40,barometric pressure 30.09″ and rising. We picked up 0.01″ of rain in the past 24hrs. Yesterday’s high was 66, and the overnight low was 40. With cool Canadian high pressure over the region, we have a fine day on tap! We’ll see sunny skies with highs in the lower 70s and light and variable winds, becoming northerly around 10 mph this afternoon. Tonight should be mostly clear until midnight, then become partly cloudy. Lows will be in the lower 50s with light and variable winds. Friday should be partly sunny and warmer with highs in the upper 70s and light and variable winds, becoming northerly around 10 mph in the afternoon. Friday night should be mostly clear with lows in the mid 50s and northeast winds around 10 mph. Saturday’s looking partly sunny with highs in the lower 80s and south winds around 10 mph. Saturday night should be mostly cloudy out ahead of an approaching low pressure system that will bring showers Sunday. Lows will be in the lower 60s. Last year on this date we had a high of 76 and a low of 56. We picked up 0.19″ of rain. Record high was 97°F in 1963. Record low was 45°F in 1912. Tomorrow will be 2m 7s shorter. The Moon is waning gibbous, 17d 3h old with 90% illumination. 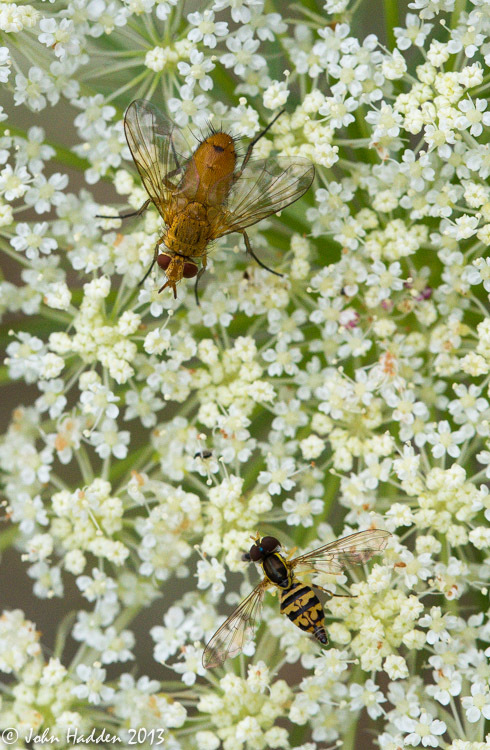 Queen Anne’s Lace attracts all sorts of bugs this time of year. Some of the flower heads along our driveway had five or six different kinds of insects on them ranging from soldier flies and bees to ants and beetles. All are attracted to the abundant nectar from the Lace’s many tiny flowerets. Nikon D600, Sigma 105mm lens, ISO 1250, f/13, 1/800″ exposure.